The Standard Automation Light Grid from SICK can be used in a number of solutions, such as detecting and counting of irregularly shaped objects, checking for presence and protrusions of pallet loads. Light grids from SICK offer multiple ranges, heights, sizes, orientations, and resolutions. All processing is integrated in the light grids for fast setup with no external controller needed. Established in the year 2008, we, “Process Control Instrumentation Network”, are a renowned name engaged in trading and exporting Panel AC, Proximity Sensors and Pressure, Flow, Temperature & Level Instruments. Our offered range us sourced from some of the most reliable and versatile vendors in this industry. The professionals of our vendors manufacture these products using advanced machine and productions techniques. 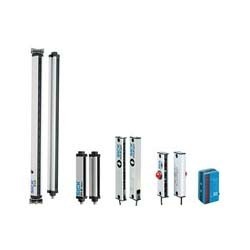 Our offered products are widely acknowledged in the market for their attributes like reliable performance, dimensional accuracy, low maintenance, easy installation, user-friendly functionality and long service life. Our offered panel AC are used inside CNC electrical electronic control cabinets to cool and maintain a particular temperature. In addition to this, we provide maintenance and repairing services for the offered range at the clients' premises.